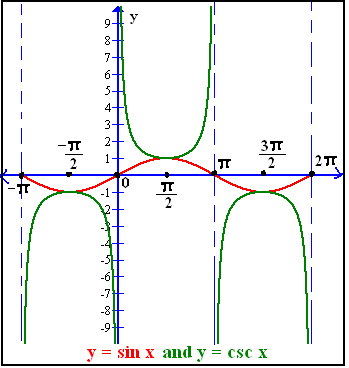 Cosecant Graph : We know that (cosec)csc x = 1 / sin x.It is a reciprocal of sine. When the sine function is zero then the cosec is undefined. When the sine function is maximum at 1, cosec is minimum at 1 and when sine function is minimum at -1, the cosec is maximum at -1. The sine function has period 2π so the cosec function has also period 2π. As cosec is a reciprocal of sine function so for some values this function is discontinuous. 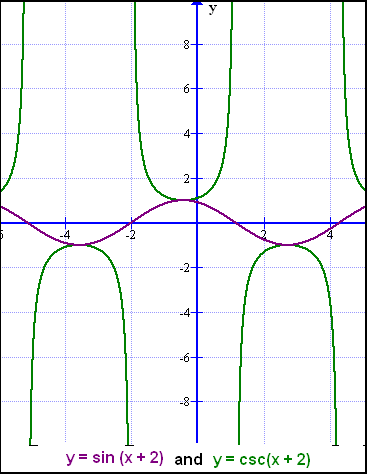 There are vertical asymptotes in cosec graph.The asymptote repeats after every π units. We know that csc x ≤ -1 or csc ≥ 1. First, we graph y = sin x and then y = csc x immediately below it. Compare the y-values in each of the 2 graphs and assure yourself they are the reciprocal of each other.The x-intercept of y=sin x and the asymptotes of y = csc x are same. The cosec graph is a ∪ shaped graph. There is no amplitude for this graph. b and c are responsible for phase shift. Phase shift means the graph will shift towards left or right side from its normal position.The displacement of the graph is based on bx + c. Make this equal to zero and solve for x. Example : If y = csc(x +2) then first graph y = sin (x +2). Phase shift is -c/b where c = 2 and b = 1(coefficient of x). so the sine graph will shift 2 units to left side. So the csc graph will also shift towards left by 2.